Today we stand united as the Jewish Nation to honor our brothers and sisters who have tragically died on the battlefields and in the terrorist attacks and the soldiers of the IDF and the Jewish Underground that fell in combat during the wars to protect the Jewish people and the State of Israel. We are joining Am Yisrael, who are gathering to mourn and honor our fallen soldiers and as if the wars are not enough, and there are not already so many bereaved families, the daily reality keeps hitting us, adding more and more families to the long list of those whose lives are forever changed. Major Ro’ee Klein was killed on July 26, 2006, in a fierce battle in the southern Lebanese village of Bint Gebail. Along with him, seven soldiers in his unit were killed in this deadly battleRo’ee Klein, a Commander of a Golani Unit, was killedעל קידוש ה’ when he leaped on a live grenade, acting as a live shield for his soldiers. For this heroic act, Ro`ee received a distinguished honorary award. He was buried on his thirty first birthday, leaving behind a wife and two sons. I was blown to the ground from the explosion, and I see you, or what was you, laying on the ground right next to me, your hands touching my feet. Ro`ee – almost two years have passed since that dreadful battle, two years of nightmares, of unexplainable outbursts of tears. Two years in which I’ve been waking up every morning realizing that my life was given to me as a present from you. I am alive and well. I still cannot believe that you jumped on that grenade to save the rest of us. I was lucky to have you as my commander this past year, not knowing it was the last year of your life. My live has changed a lot because of you, I learned so much from you. Your life was the perfect reflection of all the ideals that you believed in, and you practiced them in every way possible. I am not a religious person, nor was I brought up on religious values like you were. But when I saw you jumping on the grenade with the Kippah on your head, I knew what was missing in my life, and in which direction I should search. During the Shiva I got to know your friends from Bnei Akiva, from the Yeshiva in Eli, and other soldiers that were in the army with you before. We feel a huge emptiness in our lives, now that you aren’t with us anymore. You were our role model, you taught us about the love of Israel, the love of the people and the love of the land. Everyone who knew you was touched by your charming personality. I admired you as my commander. I felt you were my friend, and I loved you like a brother. I know that now you have a place of honor in our history, but you should know that you will always bemypersonal hero. Thank you for giving me another chance to be a father to my son, and a husband to my wife. Ro`ee, my hero – I will remember you forever. Yoni, my big brother, is the strongest person on earth, he is very very tall, and his teeth are really white. Mom says that whenever he smiles he melts every heart around him. Yoni, my big brother is the strongest person on earth. He lifted me up so high once that I was sure I’m going to touch the ceiling, or that the clouds would hug me and I would be able to say hi to them. He really is the strongest person on earth. Yoni, my big brother, is also very smart. Whenever he came home from school with a test, mom would hug him and say “good job”. He is so smart that when I asked him what colour is the moon, he knew the answer! He said it is a very very light colour, like a Lilac. I didn’t know what that color was, so he showed me. It’s kind of weird, I always thought the moon was white, I was kind of scared of the moon, so Yoni, my big brother, told me I shouldn’t be afraid of the moon because it keeps people safe, so they won’t be scared of the dark. But my brother Yoni, isn’t only the strongest and the smartest, he is also the bravest! He told me he was joining the IDF, but I didn’t know what the IDF was, so he told me it’s a bunch of soldiers protecting people, like my Ken doll protects Barbie! He would always tell mom what he does in the IDF and say that he misses her whenever he goes, and that he likes her food the best, to compliment her, I think. But once, I heard him cry at night. Mom hugged him and asked him what’s wrong and he told her he killed a soldier, right in his face… I didn’t believe him, I thought he just told mom because he doesn’t want to be sad about the real reason he was crying. But then he told her his best friend died in an “activity”, I think it was called an “activity”. Sometimes he would cry really quietly when he came back from the Army, so quiet, that only I could hear him. One time, I went to his bed and hugged him, I didn’t ask him why he was crying, it was obvious that it’s because he’s scared of the dark. But I protected him, I also hugged him and told him that he knows that the moon protects the people so they won’t be scared of the dark, so he really shouldn’t cry. Yoni, my big brother, went to the Army the next day, but it was a long time ago, he never comes back anymore. I don’t know why, but I miss him a lot. Mom said he moved in with the moon, so I wrote a letter to the moon, that he should keep Yoni safe, so nothing will happen to him, so he won’t be scared of the dark. Zvika bron in Haifa on May 1986, son to Yehuda and Zila and brother to Zipi and Elisheva. Already in his childhood and youth Tzvika devoted a majority of his time to volunteer, to be part of social activities with different organizations and to his yout movement as well. After two years of study in a pre military acdemy in Ali, Tzvika enrolled for service and reached the Special ops Unit of the Golani Brigade. In this unit he rose to commander and office execling in each role. In 2008 he married Adi and they had two boys, Elkana and Nadav. Dec 27, 2002 – Zvi Zieman, 18, of Reut was one of four yeshiva students killed in Otniel while working in the yeshiva kitchen, serving the Shabbat meal to some 100 students in the adjacent dining room. Around 7:30 P.M. Friday, two terrorists from the nearby village of Dura in the Hebron area infiltrated Otniel, cutting the fence. They wore army uniforms, carried M-16 rifles, ammunition and hand grenads. The yeshiva, located a short distance from the fence, is a large, well-lit building, and the terrorists chose it as their target. About 100 yeshiva students were gathered in the ground-floor dining hall, waiting for the Friday night Shabbat meal. The two terrorists began to spray the building with bullets from the outside and one entered the kitchen via a service entrance. The four unarmed yeshiva students who were working in the kitchen were killed. St.-Sgt. Noam Apter, who was on kitchen duty, managed to lock the door to the adjoining dining room before he was shot dead, saving the lives of the students seated at the tables, who opened fire from the dining room. The two terrorists from the Islamic Jihad, which claimed responsibility for the attack, were later killed by IDF forces. Zvi (Zvika) Zieman, the second of six children, settled in Reut, located about midway between Tel-Aviv and Jerusalem, with his family 12 years ago. He completed both elementary and high school in the nearby religious community of Hashmonaim. After a trip to the United States and a year of study at the Otniel yeshiva, he entered the hesder yeshiva program there, in preparation for his upcoming army service. A model airplane enthusiast, he hoped to serve in one of the Air Force MRPV units (mini remotely-piloted vehicle) or in Army Intelligence. Zvi was active in the Gesher movement, which sought to foster understanding between secular and religious Israelis. He also loved music. Nissim Sean Carmeli, a 21 year old American citizen from Ra’anana, died on Saturday, July 19th, 2014 while serving in the Golani Brigade. Staff Sergeant Carmeli was killed in a shoot out with Hamas terrorists in Gaza. Carmeli immigrated to Israel from Texas while in high school. After graduating, he stayed in Israel and enlisted into the Israel Defense Forces (IDF). Carmeli’s parents decided to move to Israel after his death. Sean completed high school in Ra’anana, and went on to join the army where he served with honor and distinction in the Golani Brigade. “Just before it was time for him to enter the army, Sean made a decision to spend some time in a yeshivah,” Hecht recalled. The Rabbi said that when Sean was called up, his superior told him that he did not need to go to the front because of a wound on his foot. Sean, however, insisted on accompanying his comrades into Gaza. Nissim Sean Carmeli is survived by his parents, and his sisters. Staff Sergeant Carmeli was buried in Haifa’s Neve David cemetery on Monday night. There had been concerns that the lone soldier, who split his time between Ra’anana and South Padre Island, Texas, where his Israeli parents live, wouldn’t have enough people paying their final respects at his funeral. Since Carmeli was a huge fan of Maccabi Haifa, the soccer team posted a photo of Carmeli on its Facebook page after his death, asking fans to go, so that his funeral wouldn’t be deserted. The team also announced that it would have two buses waiting at the cemetery to bring people back to the country’s center, after the 11 pm service. Twenty thousand of people arrived at Carmeli’s funeral to say a final goodbye to the soldier. It was a great week full of science experiments and travels. 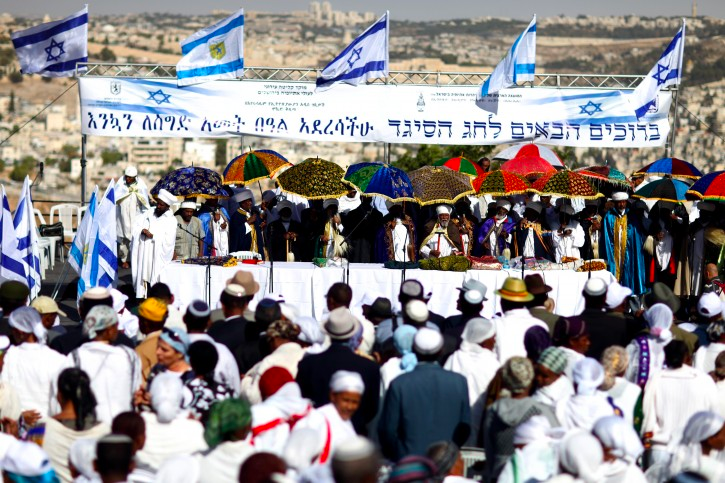 The Ethiopian Jews are one of the ten tribes that were exiled from Israel before the destruction of the first Temple.